At one of our library volunteer work sessions each second Monday of the month, I was asked to try to give guidance on our various obituary collections at the Ohio Genealogical Society. We have indeed been collecting obituaries since our library became a reality in the early 1970s. Walking through the front library door into the Barnes Reading Room, visiting patrons see several wooden card cabinets containing over 600,000 Ohio obituaries mounted on 3x5 cards. These were collected from 1973 to 2016 and were recently scanned by FamilySearch. Images will be open to LDS church members, and eventually a public every name index will be generated which will point users to the OGS Library for the images. Since 2017, we have been filing any new obituary cards received in cabinets in our Ellis Computer Lab for future digitization. We also have a partial index of our Florida obituaries on our web site - https://www.ogs.org/research/search_floridaobits.php - and we have a volunteer working to complete this. These are Ohioans who were snowbirds or who retired to Florida and died there. Volunteers from our Florida Chapter OGS send us these on a regular basis. Perhaps our most used obituary collections are those found in the Hayes Presidential Center’s Ohio Obituary Index - https://www.rbhayes.org/main/ohio-obituary-index/ - developed by former OGS Trustee Rebecca Baker Hill. These now come up in an Ancestry.com search. Our volunteers are entering a collection of 54 boxes of Central Ohio obituaries found in our Hal West Archives and have already entered several local Richland County scrapbooks. There are many county newspaper scrapbooks in our holdings that could eventually be entered into the Ohio Obituary Index at Hayes. Users find something in the index, determine the library that submitted it, and then send a fee (we ask $2.50) to that library for the obituary copy or scan. We also have several unprocessed obituaries, both those that have been donated by members and our chapters in recent months and have yet to be filed, and larger groups like those from the Cleveland papers in our Guthrie Volunteer Room. This was a project led by the late OGS Trustee Jean Barnes. The obituaries are from 1997 to 2004 and there are thousands of them. Jean and her crew put many on cards but we now just leave them in original form and use the Cleveland Public Library’s “Necrology File” as an index - https://cpl.org/newsindex/ - We are also beginning to place digital copies of some our county obituary scrapbooks in the member side of our OGS web site. Many of our county chapters have done extensive work with obituaries in their area. We house the original Crawford County obituaries in our library (going back to the 1860s) but the images are free on FamilySearch - https://www.familysearch.org/search/catalog/1384728?availability=Family%20History%20Library – and an index to the massive Washington County, Ohio Obituary project was just announced by FamilySearch this week - https://www.familysearch.org/collection/2358414 - although the index is not quite linked with their catalog entry yet. We also subscribe to many newspaper database providers for the benefit of our library patrons. We can get those on GenealogyBank, Ancestry.com, Newspapers.com and NewspaperArchive.com. Additionally, there are free sites out there like ChroniclingAmerica - https://chroniclingamerica.loc.gov/ - Ohio Memory - http://www.ohiohistoryhost.org/ohiomemory/newspapers - and Google Newspapers - https://news.google.com/newspapers. 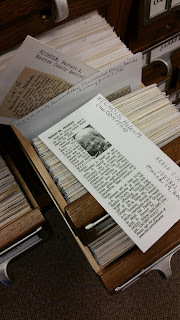 Who uses all these wonderful obituary collections at the Ohio Genealogical Society? Well, quite honestly, most of the obituary requests that we receive each week are from young researchers who are working in the oil and gas industry trying to trace descendants of landowners back in the 20s and 30s who signed leases that have expired. But perhaps they will grow up to be genealogists someday! There’s a lot of good information in Ohio’s obituaries for family historians too!